Extensible Hypertext Markup Language, or XHTML, is a family of XML markup languages that mirror or extend versions of the widely used Hypertext Markup Language (HTML), the language that web pages are written in. Benefits of XHTML Modularization- WaSP. The Case for XHTML - Faruk Ates. The Economics of XHTML - Rakesh Pai. Why Switch to XHTML? - Lee Underwood. XHTML: Benefits - Carrie Bickner and Jeffery Zeldman (The New York Public Library). An Introduction to XHTML - Dan Wellman. Behind the Scenes with XHTML - Lee Underwood. DevGuru XHTML Quick Reference Guide - DevGuru. Getting Friendly With (X)HTML - Eric A. Meyer. HTML or XHTML? - Robert Nyman. How to Write XHTML - Virginia DeBolt. Learning XHTML - Simon Jessey. Making Lists Using XHTML - Dan Cederholm. Migrating from HTML to XHTML and XML - Char James-Tanny. Migratingfrom HTML to XHTML and XML: Part 2/2 - Char James-Tanny. Quick guide to XHTML - Anne van Kesteren. Programming: XHTML - Wiki Books. To Use or Not to Use: An XHTML Roadmap for Designers - Molly E. Holzschlag. What is XHTML by Ian Graham. XHTML - An Introduction - Nick Wilson. XHTML Explained - Ross Shannon. XHTML in the Real World - Molly E. Holzschlag. XHTML in the Real World Part 2 - Molly E. Holzschlag. 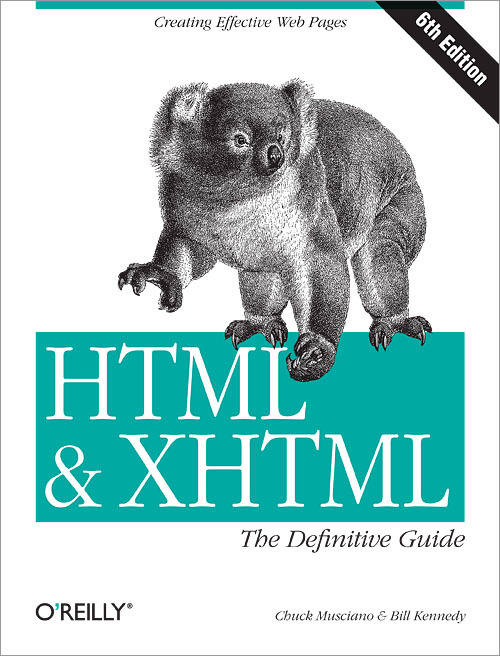 XHTML: The Transition From HTML to XML - Samuel Gallard. XHTML Tags Reference - WebRef. Put everthing you need to know about HTML and XHTML at your fingertips. For nearly a decade, hundreds of thousands of web developers have turned to HTML & XHTML: The Definitive Guide to master standards-based web development. Truly a definitive guide, the book combines a unique balance of tutorial material with a comprehensive reference that even the most experienced web professionals keep close at hand. From basic syntax and semantics to guidelines aimed at helping you develop your own distinctive style, this classic is all you need to become fluent in the language of web design. Choosing a DOCTYPE - Gez Lemon. Choosing a DOCTYPE - Web Design Group. How to read the HTML DTD - W3C. Using the DOCTYPE Tag - Lee Underwood. Content Negotiation - Roger Johansson. Doctype Declarations and Content-Type Headers - Tommy Olsson. From the Top: MIME and Content Negotiation - Karl Dawson. HTML Compatibility Guidelines - W3C. I'm Quitting XHTML - Charlie Petitt. Joining the XHTML vs HTML Discussions - David Andersson. MIME types matter; DOCTYPEs don't - Anne Van Kesteren. DOCTYPES not relevant? - Molly Holzschlag. MTAdmin and XHTML - Jacques Distler. Redefining Tag Soup - Faruk Ates. Sending XHTML as text/html Considered Harmful - Ian Hickson. Serving up XHTML with the correct MIME type. Serving XHTML 1.0 - W3C. Serving XHTML with the Right MIME Type - WaSP Asks the W3C. The Perils of Using XHTML Properly - Roger Johansson. The Road to XHTML 2.0: MIME Types - Mark Pilgrim. The xml Prolog, Strict Mode, and XHTML in IE - Chris Wilson. Why HTML Does Not Matter - Egor Kloos. XHTML and Error Handling - Robert Nyman. XHTML, http accept-header and mime-type application/xhtml+xml - Jesper Tverskov. XHTML Is Dead - Tommy Olsson. XHTML is not for Beginners - Lachlan Hunt. XHTML is invalid HTML - Anne Van Kesteren. XHTML vs. HTML Redux - Rob Mientjes. Changing (X)HTML page encoding to UTF-8 - Richard Ishida. Elements of Meaningful XHTML - Tantek Celik. Get Down With Markup - Dan Cederholm. HTML and XHTML Frequently Answered Questions - Steven Pemberton, Editor. HTML Comes of Age: XHTML - Don Kiely. OBJECT of desire - Jeffery Zeldman. Quick Start Your Design with XHTML Templates - Kevin Hale. Seven Deadly Markup Sins - Molly Holzschlag. Separator Elements - Lachlan Hunt. Strictly Speaking - Patrick Griffiths. The Future: HTML or XHTML- Lachlan Hunt. The Future of HTML (1/2): WHATWG- Edd Dumbill. The XHTML 100 - Evan Goer. Writing Semantic Markup - Joshua Porter and Richard MacManus. XHTML Anatomy: A Document Deconstructed - Molly E. Holzschlag. XHTML and CSS Code Commenting - Ben Buchanan. XHTML is the Most Important XML Vocabulary - Kendall Grant Clark. XHTML v. HTML: a tiresome debate - Molly E. Holzschlag. All That We Can Leave Behind - Mark Pilgrim. How easy is XHTML 2? - Anne van Kestere. Questions on XHTML2 - Anne van Kesteren. The Vanishing Image: XHTML 2 Migration Issues - Mark Pilgrim. The Web's future: XHTML 2.0 A sneak peek at the changes - Nicholas Chase. XHTML2: Accessible, Usable, Device Independent and Semantic - Steven Pemberton and Mark Birbeck. XHTML 2 and all that - Jeffery Zeldman. XHTML 2.0 Considered Hopeful - Tantek Celik. XHTML 2.0 Drafted - Michael Claben. XHTML 2.0 Explained - Sasha Slutsker. XHTML 2.0: The Latest Trick - Kendall Grant Clark. XHTML 2.0 - What is It? - Jennifer Kyrnin. Why isn't XHTML2 backwards compatible? - W3C.